This Q&A was part of my free online course (which you can still sign up for). 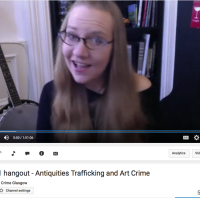 Anyone considering applying for my online master’s courses in Antiquities Trafficking and Art Crime (University of Glasgow) should probably watch this. This is how I lecture from afar.